For the free PalmOS version (Chess Tiger 2010): click here. Chess Tiger for iPhone is the strongest chess program for iOS (iPhone, iPod touch and iPad). Chess Tiger is originally an extremely strong program for the PC platform. It is currently sold under licence by Schroeder BV (Schröder BV, the makers of Rebel and Rebel-Tiger), Lokasoft, ChessBase (the makers of Fritz and Shredder) and Convekta (maker of Chess Assistant). Before Chess Tiger, there were only a few strong chess programs for iOS (iPhone, iPod touch and iPad): ChessGenius, Fritz, Hiarcs and Shredder. Now ChessTiger is available! Does it mean that it is the best? It's up to you to decide. 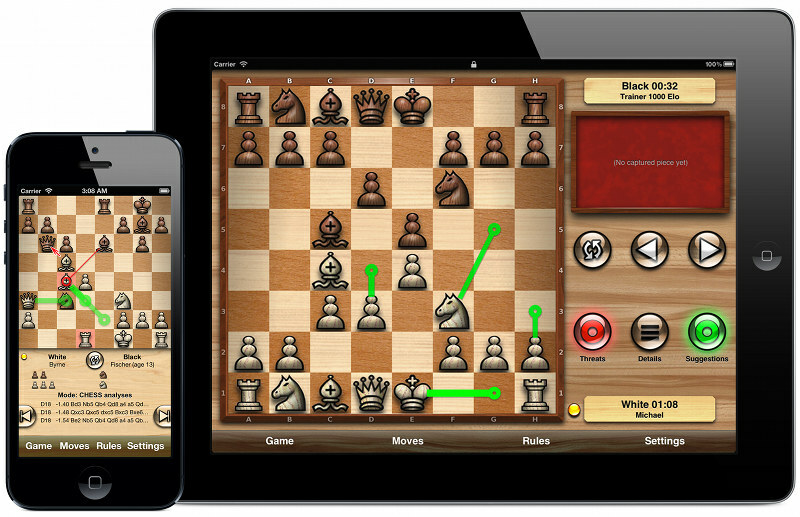 Is Chess Tiger for iOS, iPhone, iPod touch and iPad a chessmaster? Just check it out with this free download evaluation version. Then you can feel what Kasparov felt in front of Deep Blue!! !